Dr. McEwan is co-PI on a grant from the National Science Foundation (OPP:1708309) to study fire and ecosystem dynamics in the Siberian arctic. The dominant woody plant in this systems is larch (Larix cajanderi) which has a strong effect on carbon storage. The project focuses on regeneration dynamics of this species in relationship to fire, which is a significant ecosystem disturbance that is increasing in severity through time. Dr. McEwan is PI on a grant from the Centerville-Washington Township Park District to develop a habitat management plant for a fascinating property in southwestern Ohio. Bill Yeck Park is approximately 200 acres and contains a wide variety of habitats including meadow, marsh, wetland, riparian forest and upland forest. The goal of the project is to identify habitats of particular interest and provide information towards developing a long-term management plan that will address invasive species, aquatic habitats, and conservation within the context of multi-use management. Dr. McEwan is PI on a grant from the City of Dayton (Ohio) to establish a measurement protocol for the effects of urban stormflow on the biology of freshwater rivers within the city. This is an exciting project that aligns our scientific activity directly with objectives of the city in which we are located. In this project we have established a training platform for students and created a long-term partnership between the lab and the city. The summer of 2018 will mark the 4th year of the partnership which now includes Leslie King from the University of Dayton Rivers Institute and a new collaborator from UD Civil Engineering- Denise Taylor. The lab has had numerous projects that focus on invasion of forests by the exotic shrub Amur honeysuckle. For example, Dr. McEwan was PI on a grant from the National Science Foundation that focused on how the invasions of Amur honeysuckle (Lonicera maackii) along riparian zones impacts the biodiversity and functioning of headwater streams. Executing this project was been a dominant activity in the lab ca. 2014-2018. Projects continue! The lab is engaged in a long-term collaborative project to explore the ecology of subtropical forests in Taiwan. Dr. McEwan was PI on a grant through the Smithsonian Institute Center for Tropical Forest Science which helped launch this collaboration. The overall goal is to understand how biodiversity and ecosystem function are related in the high diversity subtropical broadleaved forests of Taiwan. Two great things about research in Taiwan are (a) the infrastructure for research is outstanding, and (b) some of the forests are heavily typhoon impacted, which acts as an interesting “ecological filter” on which species can persist. This project is part of a long-term, ongoing, collaboration with Dr. Jyh-min Chiang at Tunghai University in Taiwan. Dr. McEwan has been involved in a constellation of research activities that revolve around the idea of understanding how temperate deciduous forests of eastern North America are changing over the long-term. 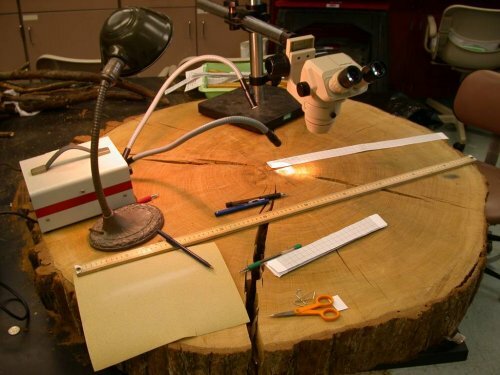 These projects include (a) long-term monitoring project in old-growth forests (b) using dendrochronology to document processes such as gap dynamics and fire in various forests, and (c) a collaboration with Neil Pederson of Harvard Forest and Jim Dyer of Ohio University to assess broad scale dynamics in these forests, particularly focused on climatic effects. Chapman, J.I., A.L. Myers, A. J. Burky, and *R.W. McEwan. 2015. Edge effects, invasion, and the spatial pattern of herb-layer biodiversity in an old-growth deciduous forest fragment. Natural Areas Journal 35: 439-451. Goins, S.M., J.I. Chapman and *R.W. McEwan. 2013. Dynamics and disturbance in an old-growth forest remnant in western Ohio. Natural Areas Journal. 33: 384-394.